As I mentioned in my last post, there are two main styles when it comes to staying organized—proactive organizing and reactive organizing. It’s important to note, however, that these approaches fall on a continuum. If you start with your basic preference (proactive or reactive) then you can look for ways to incorporate strategies that are most inline with what works best for you. Maintain as you go. One of the most proactive strategies is to maintain as you go. This involves creating habits such as putting things away as soon as you’re finished using them, and using the one-in-one-out rule. This means you let go of something old every time you purchase something new. 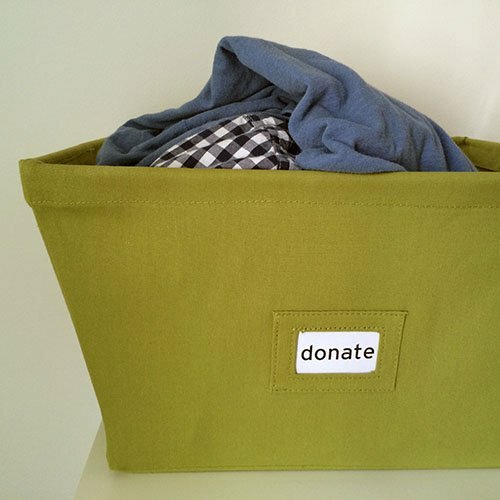 For example, if you buy a new pair of pants, you immediately pull an old pair of pants out of your closet and drop it into a donation bag. Scheduled maintenance — Daily, Weekly, Monthly, Quarterly or Seasonally. The next series of proactive strategies is to schedule set times to organize and maintain your organizing systems. Maintaining spaces on a set schedule, whether they need it or not. (i.e. cleaning out the refrigerator once a week versus when you begin to notice drips, crumbs or crowding that makes it difficult to put items away.) The more frequently you schedule these maintenance sessions, the more proactive you’ll be. For example, you could carve out time in your daily routine for tidying up, or you could set aside a certain day of the week for maintaining order. Or you could schedule monthly, quarterly or seasonal organizing sessions. The longer time between scheduled sessions, the more reactive, and the more you’ll begin to see visual evidence that you need to tidy up. In other words, the less often you maintain order, the more clutter will begin to build up. Maintain it when it needs it. The last approach to maintaining order is completely reactive. You intervene only when a space truly needs an intervention. Again, this can be the most stressful—especially if clutter paralyzes you or you worry about what other people think of your home. But, if you love the process of organizing, it can be the most rewarding. If you’ve never had an official organizing maintenance plan before and you feel your style is more proactive, consider creating maintain-as-you-go habits. As a backup plan, schedule frequent maintenance sessions such as adding a “daily tidy” to your to-do list, or scheduling a weekly maintenance session. Once you begin regular maintenance you may find that your home needs less regular interventions and you can spread out your scheduled maintenance sessions. Whatever approach you choose, take note of how you feel in the upcoming weeks and months. Do you feel good about your home and your approach to organizing? Do you feel like you’re spending the right amount of time on keeping things tidy? If so, you’re on the right track for you. If not, try a different approach until you find the maintenance plan that fits your organizing style and lifestyle. I’d love to hear what approaches you currently use or have decided to try as a result of reading this post. Please share your thoughts in the comments! Once again I have to say that I love your approach to teaching about organizing! I thought I was a proactive organizer because I am proactive in other areas of my life, but as I read your examples I see I am clearly a reactive organizer, and cleaner for that matter! I have never been successful at daily, weekly, monthly, and quarterly lists of what to clean when. Seeing many tasks like that just stresses me out. On the other hand, if I see the floor has crumbs on it, I pull out the broom or vacuum and clean them up. When our hamper is full, I do a load of laundry and immediately fold/hang, and put away the clean clothes. I love doing online challenges such as your weekend organizing challenges or Apartment Therapy’s January Cure. Making a list of what is bothering me and then spending focused time on a project is very motivating to me. After the weekend or month is over, I take a break until I need to respond reactively. Thanks for helping me to understand myself better one more time! I realized that after reading your post I am a reactive cleaner and organizer. I don’t always like having things get messy and clutter can stress me out, but seeing a mess motivates me to action. I have tried many different plans to clean or organize regularly to avoid mess and I always give up after a while. I came to an interesting conclusion, that I always feel guilty for being this way because so many people teach or say it isn’t right. But maybe I need to give myself permission to clean the way that comes naturally and not feel bad about it! Thanks for the inspiration! I am mostly reactive, but in some ways proactive. I do a load of laundry every day from start to finish, and I clean my kitchen every evening after dinner. Most other things around the house get done when they bother me or when company is coming. It’s refreshing to know that this is ok and actually a ‘notable approach’ to housekeeping. I’ve tried to get myself into more of a routine or schedule, but I’ve never been able to stick with one. I get irritated seeing house chore lists on my to-do lists, and I’ll skip them or cross them off with thick angry lines. My husband never complains, and I’ve never been completely embarrassed when a visitor has shown up unexpectedly. Truthfully, though I don’t have a weekly schedule, I do things almost weekly anyway….I mean as soon as I see a little messiness around or in the toilet I want to clean it, and that is probably 1-2 weeks max. I just don’t want to see “clean the bathrooms” on my to-do list. I want to see my client schedule (I’m a counselor and wellness coach part-time), time slots for preparation and notes, pre-school activities with my son, play-dates, errands to run, meal plans, meal prep instructions, projects, surf reports, things of that sort! Hey, has any one of you felt like you have an organizing cycle? I am pretty sure I get organizing cravings a week before I get my period. I know pregnant women go through some organizing syndrome just before birthchild and wondered if this is something of a femenine nature. Proactive and reactive… humm I have procrastinate and then reactivation. Just stopping and starting all the time! LOL Im getting better, moving helped. I was told I couldn’t take everyone with me. I had to fight for everything I wanted on the truck. Now that its here… I see my husband point. Shhh… don’t tell him he’s right! Purging some more. Yes, very true. We should cultivate a habit of maintaining things we uses may it be clothing, home appliances or something else. The common problem we face is we forget the time of maintenance. We can try keeping note on calenders or setting up alarms for maintenance.